Primary pollutants are chemicals or pollutants emitted directly from the source. Example: SO2, nitrogen oxides (NOx), carbon dioxide (CO2), volatile organic compounds (VOCs) and other hazardous air pollutants (HAPs). Particulate matter emitted from combustion process such as automobile exhaust , industrial process or heating and cooking is also considered as primary pollutant. 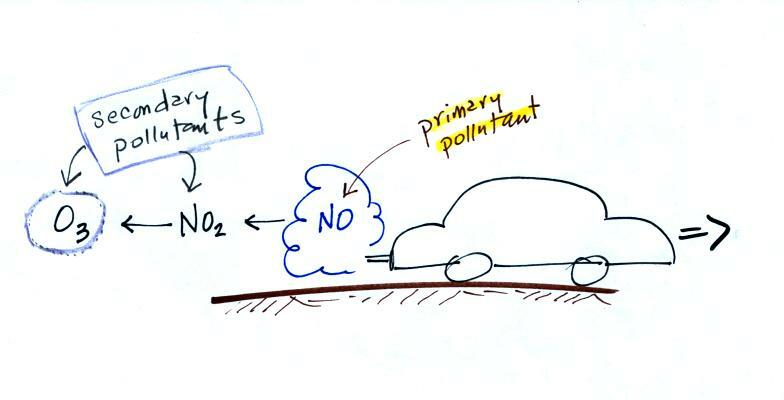 Pollutants that form from chemical or photochemical reactions in the atmosphere are called secondary pollutants. 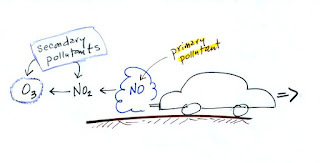 Secondary pollutants are produced most efficiently on bright, sunny days in the summer, when VOCs and NOx react photochemically in a complex series of reactions in the presence of sunlight. Ozone is a important secondary pollutant because of its potential adverse effects on vegetation, human health and property damage. Other secondary pollutants are PAN, HNO3, formaldehyde etc.